This afternoon Patti and I went to McDonalds for a soft drink after work. Patti graciously went in to get them. She said there were some young people (obviously from out of town) who were swearing loud enough to be heard by all. Using the filthiest of words, the 7 words that George Carlin said were the heavy seven. Those are the ones that'll infect your soul, curve your spine and keep the America from winning the war. I won't go into the list of what those words are I am sure you probably have a good enough imagination. She got into the car almost in tears, commenting on how this is a family restaurant and that they were saying things for all to hear. One mother moved her children to one of the outside tables to get away from it. Patti asked me why some people feel the need to say such things. I of course trying to be Mr. Answer Man said, the answer was simple A lack of ability to express themselves due to a lack of intellect. They don't have the ability of self expression, but they do know seven words that will get peoples attention "look at me," "Listen to me, I know seven words!!!" If you think that it use of this sort of language is cultural, and that it is how people of your culture are supposed to speak, maybe you should step back and take a look at the bigger picture. I doubt your ancestors would approve, and would probably be discouraged and ashamed. If not, they should be. Youth whose speech is dominated by profanities only broadcast their dismal knowledge of the English language. Language is beautiful, and the lack of consideration it receives is almost criminal. This is what I fear for the younger generation. I fear that their utter disregard - and in some cases contempt - for the importance of language and the skill of communication will prove devastating. 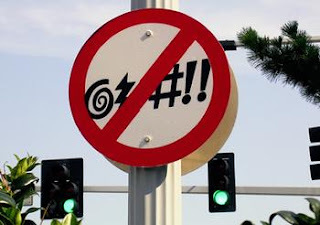 It is not only the mindless cursing that threatens to cripple our generation, but it is also the vocabularies composed of “likes,” “cools,” “uhs” and other such drivel. Teenagers do not realize it, but their inability to express themselves with meaningful words will result in no one wanting to listen to them. Their opinions will certainly not hold much sway for want of eloquence, and in many cases, coherence. Crass, juvenile speech may not hinder you now, but if it is all you practice, it will be a rude awakening when you finally realize that you cannot attain the heights you had set for yourself. Do you want to influence and shape the worlds of business, politics, or culture? Then do not make the mistake of valuing your speech so cheaply.